Successfully Added Bluetooth Rearview Car Mirror - Caller ID Display, FM transmitter to your Shopping Cart. 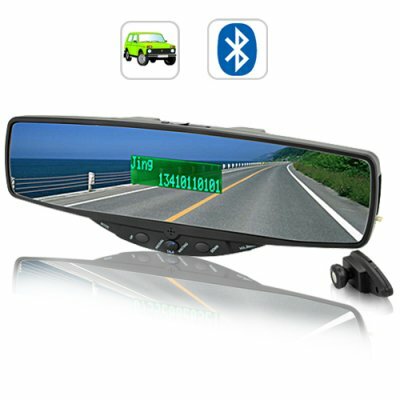 Presenting the Bluetooth rearview mirror with name & number caller ID Display! This new car gadget comes with a detachable Bluetooth earpiece for added convenience, while the built-in FM transmitter enables you to listen to calls and music from your Bluetooth enabled cell phone directly on your car's speaker system. Nothing beats this Bluetooth rear view mirror's performance! To make sure the caller can hear you loud and clear, this Bluetooth rearview mirror comes with full duplex noise cancellation MIC located right at the front of the unit, enabling you to have the most comfortable and enjoyable hands free conversation with callers. Installing this Bluetooth rear view mirror couldn’t be simpler, as this rearview mirror is designed to easily clip onto your pre-installed rear view mirror. This Bluetooth rear view mirror can also execute functions such as voice dialing, last number redial, call waiting, and pairing with two cellphones, all this and more is designed to give the driver the added measure of safety while driving. For safety, convenience, incredible features, as well as turning your vehicle into a babe magnet. Click "Add to Cart" now, and we'll express ship you a sample straight away. This Bluetooth rear view mirror with caller ID display is brought to you by the leaders in wholesale china electronics, Chinavasion. What is the mini USB port used for? The mini USB port is for factory use, it is not used for connecting media devices or any kind of electronic device. out of reach, talk, hear, and call thru this awesome device.